Requirements documentation is the description of what a particular software does or shall do. It is used throughout development to communicate what the software does or shall do. It is also used as an agreement or as the foundation for agreement on what the software shall do. Requirements are produced and consumed by everyone involved in the production of software: end users, customers, product managers, project managers, sales, marketing, software architects, usability engineers, interaction designers, developers, and testers, to name a few. Thus, requirements documentation has many different purposes. This is what most programmers mean when using the term software documentation. When creating software, code alone is insufficient. There must be text along with it to describe various aspects of its intended operation. It is important for the code documents to be thorough, but not so verbose that it becomes difficult to maintain them. Several How-to and overview documentation are found specific to the software application or software product being documented by API Writers. This documentation may be used by developers, testers and also the end customers or clients using this software application. Today, we see lot of high end applications in the field of power, energy, transportation, networks, aerospace, safety, security, industry automation and a variety of other domains. Technical documentation has become important within such organizations as the basic and advanced level of information may change over a period of time with architecture changes. Hence, technical documentation has gained lot of importance in recent times, especially in the software field. Often, tools such as Doxygen, NDoc, javadoc, EiffelStudio, Sandcastle, ROBODoc, POD, TwinText, or Universal Report can be used to auto-generate the code documents—that is, they extract the comments and software contracts, where available, from the source code and create reference manuals in such forms as text or HTML files. Code documents are often organized into a reference guide style, allowing a programmer to quickly look up an arbitrary function or class. The idea of auto-generating documentation is attractive to programmers for various reasons. For example, because it is extracted from the source code itself (for example, through comments), the programmer can write it while referring to the code, and use the same tools used to create the source code to make the documentation. This makes it much easier to keep the documentation up-to-date. Of course, a downside is that only programmers can edit this kind of documentation, and it depends on them to refresh the output (for example, by running a cron job to update the documents nightly). Some would characterize this as a pro rather than a con. Elucidative Programming is the result of practical applications of Literate Programming in real programming contexts. The Elucidative paradigm proposes that source code and documentation be stored separately. This paradigm was inspired by the same experimental findings that produced Kelp(http://kelp.sf.net/). Often, software developers need to be able to create and access information that is not going to be part of the source file itself. Such annotations are usually part of several software development activities, such as code walks and porting, where third party source code is analysed in a functional way. Annotations can therefore help the developer during any stage of software development where a formal documentation system would hinder progress. Kelp (http://kelp.sf.net/) stores annotations in separate files, linking the information to the source code dynamically. Unlike code documents, user documents simply describe how a program is used. 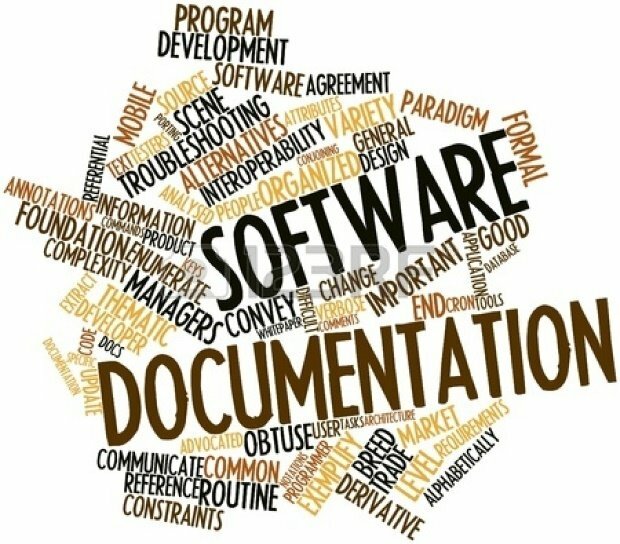 In the case of a software library, the code documents and user documents could be effectively equivalent and are worth conjoining, but for a general application this is not often true. Typically, the user documentation describes each feature of the program, and assists the user in realizing these features. A good user document can also go so far as to provide thorough troubleshooting assistance. It is very important for user documents to not be confusing, and for them to be up to date. User documents need not be organized in any particular way, but it is very important for them to have a through index. Consistency and simplicity are also very valuable. User documentation is considered to constitute a contract specifying what the software will do. API Writers are very well accomplished towards writing good user documents as they would be well aware of the software architecture and programming techniques used. See also Technical Writing. 1. Tutorial: A tutorial approach is considered the most useful for a new user, in which they are guided through each step of accomplishing particular tasks. 2. Thematic: A thematic approach, where chapters or sections concentrate on one particular area of interest, is of more general use to an intermediate user. Some authors prefer to convey their ideas through a knowledge based article to facilitating the user needs. This approach is usually practiced by a dynamic industry, such as Information technology, where the user population is largely correlated with the troubleshooting demands. 3. List or Reference: The final type of organizing principle is one in which commands or tasks are simply listed alphabetically or logically grouped, often via cross-referenced indexes. This latter approach is of greater use to advanced users who know exactly what sort of information they are looking for. "The resistance to documentation among developers is well known and needs no emphasis. This situation is particularly ambivalent in agile development because these methodologies try to avoid any unnecessary activities that do not directly bring value. In fact, the agile manifesto demands "Working software over comprehensive documentation." which could be translated as "We want to spend all our time coding. Remember, real programmers don't write documentation." 1. To excite the potential user about the product and instill in them a desire for becoming more involved with it. 2. To inform them about what exactly the product does, so that their expectations are in line with what they will be receiving. 3. To explain the position of this product with respect to other alternatives. One good marketing technique is to provide clear and memorable catch phrases that exemplify the point we wish to convey, and also emphasize the interoperability of the program with anything else provided by the manufacturer.